Creative Juice: Inspiration Journal's December Challenge - Sing, Sing it Loud! Inspiration Journal's December Challenge - Sing, Sing it Loud! The background is covered with Texture Paste stars that I dabbed with Tarnished Brass Distress Stain and then lightly misted. On the front piece I used faux batik, one of those oldies but goodies techniques. 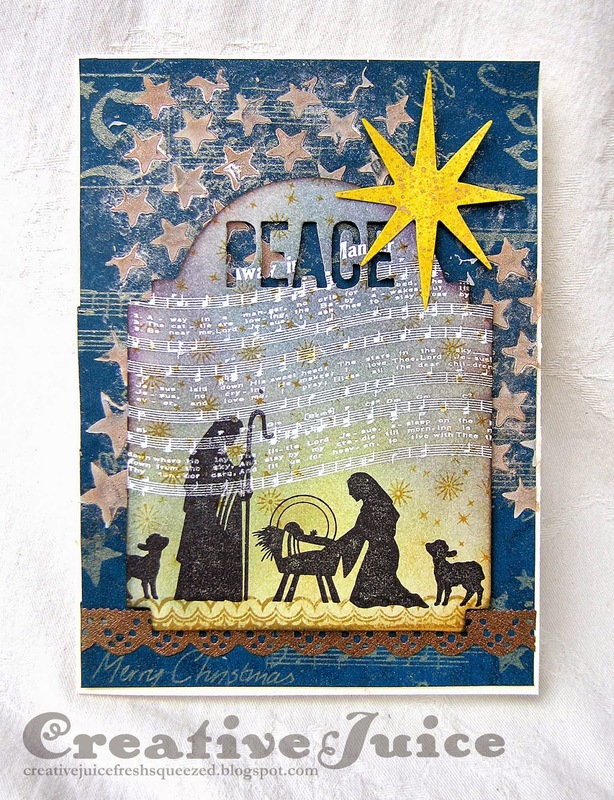 I stamped the manger scene over the batik using archival ink but it still resists a bit – I like the effect. Be sure to cruise on over to Inspiration Journal and check out all the inspiration from the rest of the DT! Join in our challenge and you will have a chance to win $50 to spend at Inspiration Emporium. I am also going to enter this into the Craft Hoarders Anonymous challenge Celebrate the Season. I am surely a hoarder of all crafty Christmas things. Who can pass up those post Christmas clearance sales? I'll tell you a secret - I've been saving the scrap of wrapping paper I used as the background for years! This is just beautiful! Thanks for joining us at Craft Hoarders Anonymous! This is beautiful. I love the music! Thanks for sharing with us at Craft Hoarders Anonymous! great texture and love the music!!!! Thanks so much for joining us at Craft Hoarders Anonymous.